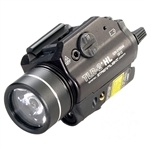 The TLR-2 is a Intensely bright, virtually indestructible, long running, rail-mounted tactical light with an integrated aiming red laser. The TR-2 Tactical LED Gun light is powered by the C4 Power LED, is highly durable, shockproof, and dustproof. The Streamlight TLR-2 Tactical LED Gun Light mounts directly to handguns with 1913 Picatinny rails, Glock-style rails, S&W 99/TSW and Beretta 92.